My foodie friend Jh received a at-home-molecular-gastronomy kit as a birthday present and invited some of us over to play. We started small with spherification, a process popularized by El Bulli's Ferran Adria. Essentially, it means shaping liquids into balls, and many have used it to create pseudo-caviar. When I saw the basic ingredients sodium alginate and calcium salt, my first thought was... WAIT. I use this basic combination in my lab to create gels for tissue engineering. Fyi, Alginate is a seaweed derivative and is widely used in medicine, pharmaceuticals, food etc. We decided to create some cranberry "caviar" using cranberry juice. In our first attempt, we fastidiously weighed each ingredient out according to instructions and allowed each mixture to dissolve and equilibrate. When the time came for us to drop cranberry-alginate into calcium solution... nothing happened. The solution just bleeded into the calcium stock. Experience tells me that when i create my own gels in the lab, alginate concentrations tended to be a lot higher and i often had to vortex or sonicate everything for a more homogeneous mixture. Also, the process happens relatively fast. So kids, if you do have cuisine innovation's MG kit, double-up the proportions so that the balls would be firmer. We managed to create actual spheres using a dropper. We also injected some liquid using a syringe to give stringy noodles. -Using a dropper to create caviar was tough work. I was dropper-ing for a good 30 minutes and amassed only a small number of balls. -Also, the balls weren't as crunchy and chewy as I expected. Singapore has a number of desserts which are peppered with a similar equivalent called Q-balls (see below), aptly named for its colloquial expression for chewy/Q. 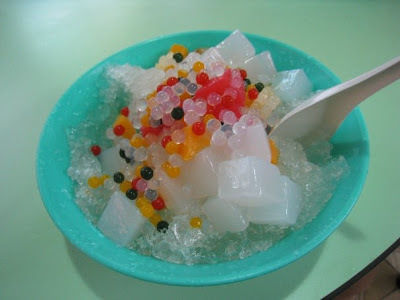 Light and refreshing nata de coco shaved ice....I want some! -Our balls were flavorless and bland. Maybe the next time, we'll use concentrate instead, since I'm assuming that the sugar in the balls diffused into calcium stock.